On Friday, April 30th 2004, the May basho soken took place in Kokugikan in Tokyo, that traditional training session of the highest ranked wrestlers performed before the gathered members of yokoshin (yokozuna deliberation council). Usually, the soken are held on the last Monday before the Tokyo tournaments, and the May soken is the only one open to the public and free. However this time the soken was moved forward to Friday, and remained closed to the public. Whatever it was that prompted the NSK to react like this, it shows a certain lack of common sense for an organization that is seeking to re-establish the popularity of sumo, (which despite this kind of behaviour, seems to be on the rise again). To understand the context better, it should be said that the Japanese only have two weeks of paid vacation every year, and that a concentration of holidays in the first week of May allows them to connect two weekends with little cost. Accordingly there is a famous "golden week", during which the whole Japan goes on vacation not only all over the world, but also throughout Japan. So, instead of offering an alluring spectacle to foreign tourists or to those coming to the capital, the NSK preferred to close it to the public for fear of the Kokugikan appearing too empty in the presence of the press. Such was the regrettable decision of the NSK, despite the fact that the Osaka tournament in March reached the mythical barrier of 700 kensho. We hope that Takasago oyakata, in charge of public relations at the NSK, will decide differently next year. 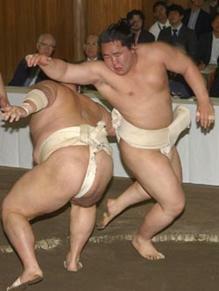 It was a fearsome and feared Asashoryu who presented himself at this soken. So far this year, he has won all the official or unofficial tournaments in which he has participated. Most impressive remains the fact that he did all this while struggling against illness (the fever in January) or injury (his left arm in March). Even handicapped he not only won, but also remained undefeated and showed every determination to remain so. So no one could have imagined what took place that Friday. 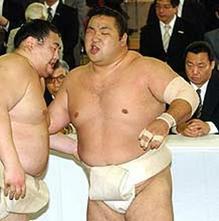 Let us admit to Asashoryu's credit that he was sick as a dog: he had caught a heavy cold and had lots of problems trying to breathe freely between the coughs. Losing his breath very quickly, the young Mongolian yokozuna was not able to show his stuff, and his movements became slow and listless. All the same, as far as his strength goes he proved to be on the road to recovery, especially concerning his left elbow, which was taped during the first bouts. At the end, Asashoryu had managed to participate in 15 bouts against Kotomitsuki, Tamanoshima and Kakizoe, losing 6 of them, and of those 3 were against Kotomitsuki. Kotomitsuki, who was more involved with 24 bouts, didn't let his performance against the yokozuna, who fled him several times, go into his head; even saying that the yokozuna hadn't given his all in the session, and that things will probably take another course in the May tournament. At the end of the Osaka tournament, the ozeki Chiyotaikai and Kaio had each won 13 bouts while an exceptional yokozuna participated in the contests. The president of the NSK, Kitanoumi, was impressed enough to declare that this performance sufficed to initiate negotiations for promotion to a superior rank at the end of the Natsu basho, providing the candidates won 13 or 14 bouts, with a victory over the yokozuna. So much was at stake for Kaio and Chiyotaikai in Kokugikan. They had to try to be at the peak of their form for that decisive May tournament. That said, they didn't seem able to start in the right direction during the soken. Already the target of much criticism during the last jungyo due to their absence from the public training sessions, the two ozeki again took it easy during the soken. Their attitude could be explained by the fact that they didn't want to aggravate their injuries and so endanger their chances of promotion: Chiyotaikai was protecting his left calf and Kaio watched over his back in order to keep the pain from resurfacing. But for both of them the same question comes to mind: how can they expect to produce the performance level required if they don't give their all at training. This obvious contradiction between their attitude and their goal has confused and even irritated numerous Japanese who still wait for a Japanese yokozuna as they have since Takanohana's retirement. Kitanoumi severely criticized Chiyotaikai in front of all present, because he let himself be battered by a very in-form Kotomitsuki. More than Chiyotaikai's result (8 wins in 14 fights), numerous witnesses were disturbed by the nature of his sumo, and very few of them now think that he has a real chance of wrapping that famous rope around his waist. 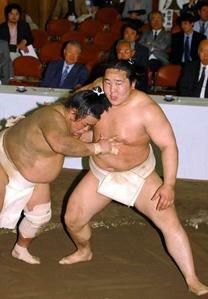 Kaio meantime didn't manage to outperform his fellow ozeki, even if he did stay unbeaten during his 9 bouts. 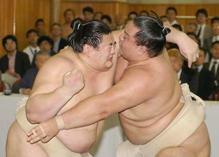 Despite barely exherting himself, his sumo was laborious from bout to bout. In short the soken did not auger well concerning promotion chances for these two Ozeki.